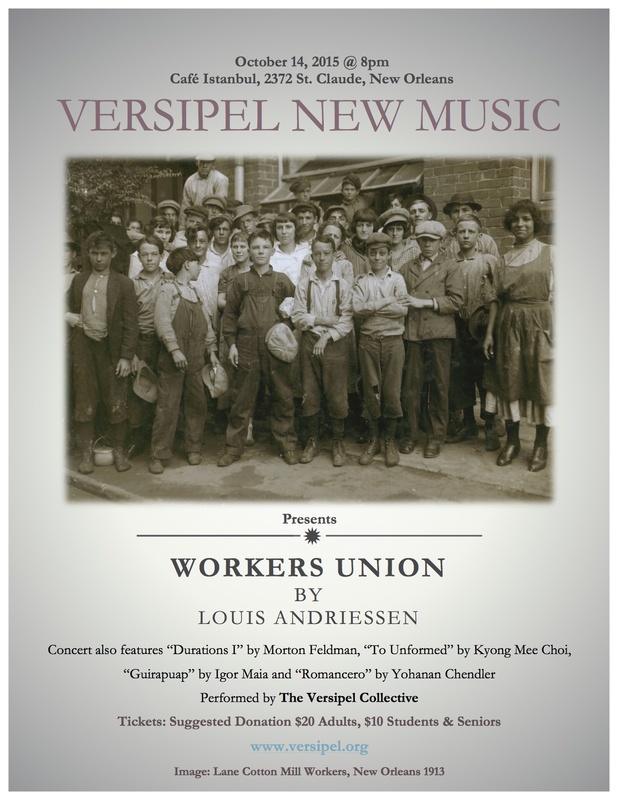 Versipel New Music’s opening concert of the season features two twentieth-century classics as well as works chosen from the Annual Call for Scores by composers spanning three continents. Together, these works cover a vast landscape of dynamic contrasts, vibrant colors, and virtuosic performances by some of New Orleans’ most exciting and active musicians. The program includes the groundbreaking rhythmic onslaught of Louis Andriessen’s Workers Union and the delicately floating timbres of Morton Feldman’s Durations I. Also on the program is To Unformed for piano and electronics by Kyong Mee Choi (USA/Korea), Guirapuap for alto flute, cello, and percussion by Igor Maia (Brazil), and Romancero for clarinet, percussion, and piano by Yohanan Chendler (Israel). Versipel New Music opens 2016 with an adventurous concert of works exploring the fringes of experimental “classical” chamber music. This collection of graphic scores, electronics, conceptual and improvisatory works explores the varied relationships between composer, performer and audience by considering extended musical and notational resources. Works by Versipel Collective composers Kari Besharse, Rick Snow and Philip Schuessler form the core of this exciting program showcasing the vibrant sounds of musical instruments and found objects with and without electronics. Additionally, the Collective will give the world premiere of I wouldn’t eat the strawberries, a new conceptual work by composer Mike Boyd chosen from our annual Call for Scores. Rounding out the program, the Collective will perform several works from experimental composer James Tenney’sPostal Pieces. Each of these brief conceptual pieces were written to fit on a post card, providing directions for introspective, performer directed music that explores the nature of sound. Tuesday, January 19, 2016, 10:30 pm. Open Ears Series, The Blue Nile Balcony Room: 10:30 pm. In February, we are excited to welcome percussionist Chris Graham back to New Orleans. This time, he will be bringing his powerhouse mixed chamber ensemble Iktus Combo. This concert, presented in conjunction with FOCI Arts, will showcase several technically challenging works of the 21st century written for the trombone. Program includes works by Katherine Young, Kurt Isaacson, Evan Johnson, Timothy McCormack, Michelle Lou, and Andrew Greenwald.